So I took Sylas with me to a local antique store to see if they had anything similar to what I had in mind. Right in the door at the first booth, I found this adorable little pail. It was priced at eighteen bucks, so I bought it. It needed some work to get it looking the way I wanted though. I cleaned it up a bit and started sanding it. There were two layers of paint/varnish and a layer of a water resistant tar-like substance. So I started with some 60 grit sandpaper to get that off. I went through a lot of sandpaper, especially when I got down to the water protectant layer (it looks black in the third photo). I didn’t want to take the bucket apart because they can be hard to get back together and I didn’t want to ruin it, so I worked around the metal rings, careful not to knock them out of place. I also sanded off the gold paint on the rings. The sanding part is probably what took up the most hands-on time of the whole project. Next I painted the whole thing white (inside and out). I let it dry in the sun for a couple hours. Next, I sanded it again with some 100 grit paper this time. I tried to get it to look worn and rustic, so I just did some random wear spots, focusing a lot around the top and bottom rims. After sanding and wiping it down with a damp rag, I stained it with some dark walnut stain and let it dry. I debated being done at that point, but I really liked the more white look. 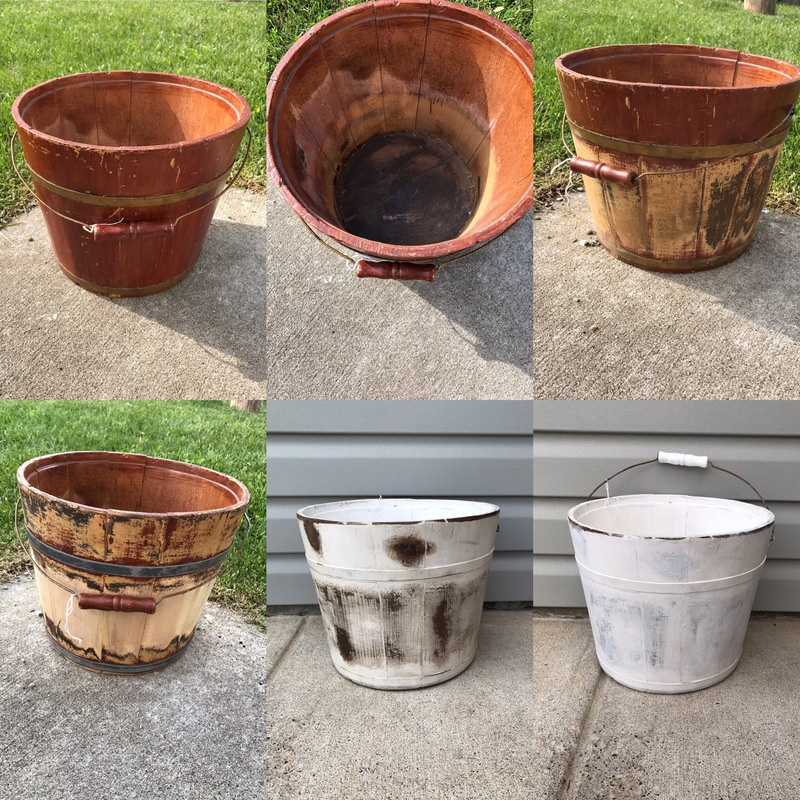 So I did a very light coat of white paint on top of the stain with a VERY dry brush -almost patting at the bucket in some places with the brush, trying to leave some of the stained wood showing through. I love how it turned out and I can’t wait to use it soon!! This entry was posted in Recipes/Tutorials. Bookmark the permalink.